The seven-member Idaho Transportation Board meets once a month to oversee the operations of the Idaho Transportation Department. 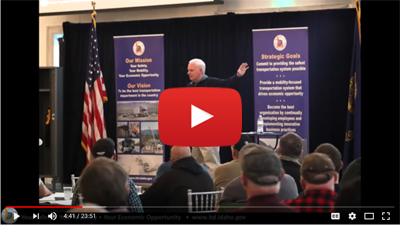 The Idaho Transportation Board establishes state transportation policy and guides the planning, development and management of a transportation network that is safe, efficient and enhances Idaho’s economy and quality of life. The Idaho Transportation Board normally meets six times in Boise and six times across the state annually. The governor appoints the board members, who are confirmed by the Idaho Senate. Six members represent each of ITD’s administrative districts and the seventh member is selected by the governor to serve as chairman. Six of the seven board members are appointed to six-year terms beginning February 1. Terms are staggered so that one member’s term expires each year. The seventh member serves at the pleasure of the governor, acts as chair and casts a ballot only in the case of a tie vote. No more than four members may be of the same political party. Members of the Transportation Board are paid $75 for each day they are involved in board related duties and are reimbursed for necessary expenses. The Idaho Transportation Board meetings are open meetings and the public is invited to attend. The Board Subcommittee on Adjustments to the State Highway System was established in 1996 to review requests to add mileage to the state highway system and to relinquish miles from the state’s system. After the Subcommittee considers a request, it submits a recommendation to the Idaho Transportation Board for action. Members of the Subcommittee are Transportation Board Members Dwight Horsch (Subcommittee Chairman), Jim Coleman, and a third member to be determined for each meeting based on the agenda, the Chief Engineer, and Local Highway Technical Assistance Council Administrator. A Federal Highway Administration representative is an ex-officio member. A Deputy Attorney General, Transportation Planning Services staff, and the Executive Assistant to the Board provide assistance. The Board Subcommittee meets on an as-needed basis. Subcommittee meetings are open to the public. Meeting agendas and minutes can be found at the “Schedules & Agendas” tab and the “Meeting Minutes” tab.